The PADI Enriched Air Diver course is PADI's most popular specialty scuba diving course, and it's easy to see why. Scuba diving with enriched air nitrox gives you more no decompression dive time. This means more time underwater, especially on repetitive scuba dives. You can typically stay down longer and get back in the water sooner. No wonder many divers choose this as their very first specialty. Enroll In PADI E-Learning For Enriched Air. This online course will teach you all you need to know about diving with enriched air. 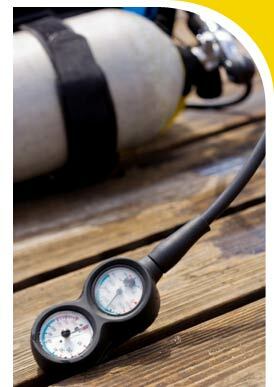 It will cover equipment used for diving with enriched air and step-by-step information on how to plan your dives. Book your two enriched air dives. After completion of these two dives you will be a certified Enriched Air Diver. - Includes all equipment needed to complete your dives. Questions about our Sunshine Coast Diving? Click below to fill out our scuba info request form!